An avowed and open defence of Distributism is not often seen in the Catholic press, and yet there is in this country a larger number than ever before of convinced distributists, people convinced that our attempt to concentrate on the mass-production of secondary commodities in return for food from abroad, to remain the workshop-or at least one of the workshops-of the world, and to treat the world as our farm and garden is doomed to failure-and indeed to disaster. The time is ripe, then, for a re-examination of distributism as a Catholic thing; but beforehand it will be worth while to look at some recent developments in the non-Catholic sphere. For the situation is very different from the time, forty years ago, when distributists might have been confused with the more or less unpractical followers of William Morris, broad1y labelled ‘arts and crafts’. The situation is even very different from that of ten years ago. The theory and application of distributism have not changed but the situation of this country has changed so as to reveal not only the practical nature of this social idea but ths necessity of it. I cannot here deal with all the associations and periodicals which have some claim to be mentioned. But an introduction to any of those here noted would probably lead an enquirer on to others not referred to. Since the whole movement is bound up with the true cultivation of the soil, which should be distributed to each according to his rights, we may begin by mentioning the Land Settlement Association (43 Cromwell Road, London, S.W.7); although it has been over-commercialised in times past it does train men to earn their living from the land, and in a substantial number of cases sees them doing so as independent small holders. Active in similar ways is the Rural Industries Bureau (35 Camp Road, Wimbledon, S.W. 19). Another substantial achievement in the technical field is that of the Soil Association (New Bells Farm,Haughley, Suffolk), which has established a research farm accomplished enough to be taken seriously both by Rothamsted Research Station and by the Ministry of Agriculture. ‘We have at last succeeded’, they say in their 1948 report, ‘in getting the patent medicine label washed off our bottle.’ The objects of the Association are ‘. . . a fuller understanding of the vital relationship between soil,plant, animal and man. To initiate, to co-ordinate and assist research in this field. To collect and distribute the knowledge gained so as to create a body of informed opinion.’ It has a journal for members called Mother Earth and it includes among its founders and supporters Lord Teviot, Lord Portsmouth, Lady Eve Balfour, Easterbrook, Rolf Gardiner, Massingham, Innes Peares, Duffy, Friend Sykes. We would couple with this association the Albert Howard Foundation of Organic Husbandry (Sharnden Manor, Mayfield, Sussex), which has in fact close connections with the Soil Association. This foundation also now has its own farm where it sets out to demonstrate rather than to research. Its objects are ‘. . . to make known . . . the principles concerning soil fertility and organic husbandry with resulting health in plant, animal and man as set forth in the writings of Sir Albert Howard; to provide demonstrations, to lay stress on health.’ I think the success of these two bodies and the rapid growth of public interest in them must be partly attributed to their wide and ‘catholic’ basis. There are no esoteric rites attached to them. They are practical, engaged simply in re-discovering some fundamental applications of the Natural Law. Turning to the publications which are now available I must first mention Health and the Soil (48 Manor Place, Edinburgh), which is the successor of Sir Albert Howard’s own magazine and works in close co-operation with the Howard Foundation. Then there is Rural Economy (West View, Horseshoe Road, Pangbourne, Berks) ‘for all interested in the Full Development of Agriculture and Rural Life’, published by arrangement with the Economic Reform Club and the Rural Reconstruction Association. These reviews are both well-informed and include a variety of subjects. To be recommended also is Country Living (Sandycroft, Dormans Park, East Grinstead, Sussex), the Editor of which declares: ‘Everywhere there is growing concern for the organic principles of good husbandry, for preserving the integrity of the family as the basic social unit. In our own urban communities there is now far more than a passive interest in the land as the source of well-being. Many readers ask for advice on how to start a new living ir some form of husbandry.’ It is surely remarkable that these three publications, as well as many others more technical, can all find a market in spite of the fact that they cover substantially the same ground. Community Broadsheet gives news of a number of communities all more or less motivated by thc desire to live a life closer to nature, from religious motives, and of almost every possible religious hue except Catholicism. (Byfleet,Surrey). I could continue almost indefinitely with this catalogue so widespread is the desire to get ‘back to the land’ and the understanding of its necessity. If it, seems that a lot of excellent work is being wasted by being so divided and scattered, it should be remembered on the contrary that this is a sign of health making it possible for these activities to act as a leaven in a way that a centralised body cannot always do. Multiplicity in unity is a good distributist and a good catholic principle. I would end this section by saying that all the aims so far referred to are the very things that Catholics, to judge by the principles enunciated in Rerum Novarum, ought to be putting into practice. 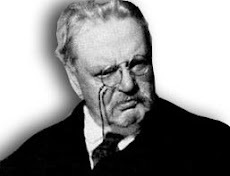 They are the things which occupied more than anything else, directJy or indirectly, the minds of four of our leading writers and thinkers of the past generation: Chesterton, Belloc, Gill and Father Vincent McNabb. Distributism in fact is a principal part of our Catholic heritage. For those who come into contact with it, it should lead the way to the Church and it ought to be the principle and ultimate aim of all Catholic social work-a sweeping statement no doubt, but Fr Vincent McNabb has not, I think, been proved wrong on this point. In ‘The Church and the Land’ (1926) he wrote: ‘More and more do we feel that the dominant, study of all Catholic Social Study Circles should be the land. We are ever opening to the view that, the land should be the main study of all the apostolic men who are hungering for the spread of Christ’s kingdom on earth.’ The first statement was based on his experience of pastoral work in the industrial areas and on his knowledge of the land, the second on his love of Nazareth as the background of the Gospel story-a background chosen by God. The recently formed Catholic Land Guild is, I believe, the only functioning Catholic organisation comparable to the associations already mentioned. Its objects are practical and straightforward. ‘It looks upon work as a vocation. By utmost production per acre it encourages and aims to preserve the integrity of the small farm and the farm worker. It aims at making farming “pay” but not at the expense of the soil or the worker. It endeavours to find situations for Catholic farm workers with or near a Catholic farmer.’ As let the Guild is only in its infancy and has little influence. To quote the secretary: ‘The biggest difficulty is that so few Catholics in England do actually take their living from the soil’. As far as periodicals are concerned, now that The Cross and the Plough has suspended publication, there is only the Register (21 Essex Street, London, W.C.2), the remote successor of G.K’s Weekly. It is concerned, however, with a distributist outlook on general affairs rather than with the detailed application of particular proposals, and has recently done a service to the cause by republishing Belloc’s ‘The Restoration of Property’. For the rest there are a number of more or less isolated attempts to live distributism. Every Benedictine monastery, and even every religious house, naturally tends towards the distributist ideal of a high degree of local self-sufficiency. As examples of the more or less conscious attempts in this direction we may mention the Cistercian Monastery of Mount St Bernard in Leicestershire, which is a delight to the eyes, the more so since the land is not naturally of a very rewarding kind-its compost heaps are an inspiration! At Buckfast, Caldey, Downside, Prinknash and at St Michael’s Abbey, Farnborough, farming is being taken seriously and other crafts undertaken or encouraged. Of smaller religious houses one must mention Campion House, Osterley, which is reported by the Albert Howard Foundation as having made 94 tons of compost between May and July last year; the house is thus like many others helping to feed itself with food guaranteed to be healthy. Finally there are the scattered remains-families and individuals-of several lay Catholic attempts at distributism-a few still living and functioning to some extent as originally intended, amongst whom is the Ditchling community. By and large, then, there seems to be among Catholics a remarkable lack of understanding of distributism or of any attempt io practise it. Yet it is in a real sense our own heritage. All the non-Catholic aims quoted above owe something, directly or indirectly, to the Catholic writers who gave publicity to the distributist ideas during the last forty years, ideas which contain the basic principles on which alone a Catholic and Christian society can be built. 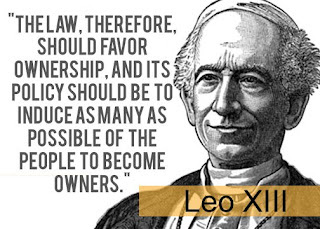 It is misleading to think that the Church is not concerned with economics and society, for she absolutely insists that society and state can only be built upon the Natural Law; and thus it is directly from the principles of the Natural Law that Leo XIII deduced his unequivocal statements on the necessary foundation of a Christian society. As these recommendations are seldom referred to it will be well to quote them here, and although some may think they are only too often being mentioned it should be remembered that the fundamental doctrines of Rerum Novarum upon which all the social doctrine of the Church is built are in fact seldom set forth. (§6) Hence man not only should possess the fruits of the earth, but also the very soil, inasmuch as from the produce of the earth he has to lay by provision for the future. Man’s needs do not die out, but for ever recur; although satisfied today, they demand fresh supplies for tomorrow and this stable condition of things he finds solely in the earth and its fruits. (§7) Those who do not possess the soil, contribute their labour; hence it may truly be said that all human subsistence is derived either from labour on one’s own land, or from some toil, some calling which is paid for either in the produce of the land itself, or in that which is exchanged for what the land brings forth. When man thus turns the activity of his mind and the strength of his body towards procuring the fruits of nature by such acts he makes his own that portion of nature’s fields which he cultivates-that portion on which he leaves, as it were, the impress of his individuality; and it cannot but be just that he should possess that portion as his verv own. and have a right to hold it without any one being justified in violating that right. (§10) It is a most sacred law of nature that a father should provide food and all necessaries for those whom he has begotten; and similarly, it is natural that he should wish that his children, who carry on so to speak and continup his personality, should be by him provided with all that is needful to enable them to keep themselves decently from want and misery amid the uncertainties of this mortal life. Now in no other way can a father effect this except by the ownership of productive property, which he can transmit to his children by inheritance. Of all the goods which can be the object of private property, none is more proper to nature than the land, ‘the holding’ in which the family lives and from the products of which it draws all or part of its subsistence. It is in the spirit of Rerum Novarzum to state that, as a rule only that stability which is rooted in one’s own holding makes of the family the vital and most perfect cell of society. If today the concept and the creation of vital spaces is at the centre ol social and political aims, should not one, before all else, think of the vital space of the family, and free it of the fetters which do not permit even the formulation of the idea of a homestead of one’s own? There can be no disguisinq that one cause of the unbalance and indeed the general confusion that has overtaken the social economy of the world and with it our civilisation and culture as a whole-one cause is undoubtedly the lamentable distaste, if not the contempt, felt for life on the land, and its many-sided and essential activities. Yet history surely teaches us-in particular by the fall of the Roman Empire-to see in such an attitude the herald of a civilisation’s decline. And it is significant that we hear sent up from the heavily industrialised regions an appeal that sounds like a cry of distress-an appeal to the countryside for the bringing up of a peasant population that shall be healthy, strong, deeply and intelligently Christian, acting as an impenetrable barrier against which the rising flood of physical and moral degeneracy will spend itself in vain. Your first concern, of course, will be with the moral and religious side of the question. And one cannot repeat too often that work on the land makes naturally for well-being both physical and moral. Nothing so invigorates body and soul as this healthful contact with nature-nature fresh from the hands of the Creator. There is no deception about the land, it is innocent of the whims, the false glamour, the feverish and meretricious lure of predatory towns (villes tentaculaires). The stability of the land, its steady well-ordered course, the patient majesty of its seasonal rhythms, are so many reflections of the divine attributes. O fortunatos nimium-oh, more than happy, happier indeed and nobler than the poet of old conceived, this race of peasants who throunh the very conditions of their life can so easily raise themselves to the Almighty Maker of heaven and earth. But your interest will also be engaged by the economic and technical side of the problem of the land, in so far as it touches the common good and social justice. You will be considering -and rightly so- improvements in peasant life through rations, organisation both of farming methods, so that more may be produced, and of selling methods, so that a fair profit may be made. In this time of all but world-wide scarcity it is not a matter of indifference that a higher yield from the land, an increased output of farm produce should help to ease the burdens now lying so heavily on whole continents brought to distress by our late calamities. It is no less needful to set going social activities that will watch over the rightful interests, the material and moral progress, the security and the future of the peasant class. This should help not merelv to stem the pernicious flight from the countryside, but to make all who work on the land better aware of their function, prouder of the dignity of their life and mission and the grandeur and holiness of their task. Small craftsmen are . . . a picked militia defending the dignity and personality of the workman. There is that unnatural struggle between employers and employed-how bitter it often is! From such strife as this the craftsman class has generally been kept free. Their small worshops very often retain a family character. Workmen and apprentices under the guidance of the headman -the 'master of his trade '-work harmoniously together to make the desired thing. Craftsmen, then, are a picked militia also for the safeguarding of social peace and for the renewal and prosperity of the national economy. But as with all other works of civilisation, so with this-a craftsman class cannot perform its social and culturd function unless it is permeated still by the spirit of Christ. The Cross must never be taken down from your homes and workshops-it must be visible there as the sign of an ever-living faith and a holy fear of God. This faith, this fear, must guide and direct your thoughts, words and deeds. Do not fail to have prayers together in your shop or working place, giving thanks always for all things to God and the Father in the name of our Lord Jesus Christ. Here then is a complete and forthright justification of the distributist thesis as it has been put forward by our great Catholic writers in this country. These are simply the things which Chesterton, Belloc, Gill and Fr Vincent, to name the principal protagonists, were saying all their lives; and yet people praised them, and still do, for their other, almost their incidental, achievements. G.K.C. 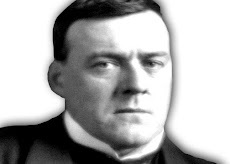 is a great poet, and Belloc a fine historian. Fr Vincent is a preeminent spiritual writer, and Gill an artist. But the one truly significant thing about all four for us today is that they had in common an organic, distributist, practical sociology firmly based on the principles set out in Rerum Novarum; and they held it as a thing proceeding naturally and inevitably, and indeed supernaturally, from their Catholic Faith. They enunciated, for their time, what can claim to be the only attempt to formulate a complete body of practical proposals for putting the first social encyclical into action. Now I am not trying to imply, as some will think perhaps, that all the work being done by the Catholic Social Guild and the Y.C.W. and other bodies in trying to put the recommendations of Quadragesimo Anno and parts of Rerum Novamm into practice in the industrial sphere is useless. But how much more effective their work would be if there were another body, or another sphere to their activities, which tried to do something on a long view, tried, as well as saving the souls of the great majority of Catholics who live in the town, to start the building of a Christian society as indicated by Leo XIII, and tried to grapple with the industrial problem on a long view as indicated by Fr Vincent in the quotation made earlier. In plain words this means that some sort of Catholic Land Settlement work has to be done. Past attempts to do this have met with such very severe treatment from every quarter (from God’s representatives, general circumstances, and their own members-a positively Job-like situation in several cases) that one might be tempted to suppose that God does not wish it. But the Book of Job encourages us to see the devil’s work in adverse circumstances, the devil’s work used by God as a lesson to strengthen and prepare. The words already quoted from the Holy Father convince us that this is the only possible interpretation to put on these ‘failures’. We would make a plea then for a fresh approach by Catholic sociologists to this subject of work and the land and crafts, in fact to Distributism. This is not the place to outline details. Suffice it to say that the secular organisations referred to above show that there is now plenty of scope for thoroughly practical work in this direction. And Catholics would bring to this movement the essential truth that the natural law is not enough. Without the supernatural law it will not be possible to enforce the natural law, even though its existence be understood. That a return to the land of some sort is coming can hardly be doubted. The country would now be very meagrely fed indeed were it not for large gifts of food from abroad. Eventually sheer necessity will drive us back to the land. So, a great duty lies with us to see that this return is effected in a Christian fashion. Preparations need to be made now so that this return will not be a mere industrial exploitation of the land, the application of factory techniques to soil and animal. In the end it will need the supernatural charity of Christians to ensure that the natural law, as it is being re-discovered in organic farming and in the ‘law of return’, is kept. We need Catholics on the land all over the country, keeping the natural law, putting up with the hardships of Nazareth, and finding there a cross to bear joyfully. And this brings me straight to the central theme of The Church and the Land, which Fr Vincent developed with characteristic forthrightness in the opening passages. The great lesson from Exodus: . . . ‘No people has ever left the town for the land, or remained on the land when it could have gone to the town, except under the motive of religion’. By . . . economic and ethical induction we had stumbled upon the great principle of Jesus himself, ‘Be not solicitous therefore, saying, What shall we eat? or, What shall we drink? or, Wherewith shall we be clothed? For after all these things do the heathen seek. For your Father knoweth that you have need of all these things. And finally a quotation from Nazareth or Social Chaos, so that we may remember the dangers of abuse of this same life on the land. Fr Vincent’s seer near Lindisfarne is speaking, describing the state of the old monasteries before the reformation: ‘Fields added to fields, lands bartered and bought till the distant holdings of an Abbey were far beyond a day’s journey even on horseback. Thc Abbey lands, once a sufficient croft round a House of God, now become an estate too wide for the soul of it to be present in every part. Its limbs were swelling. It was sickening to death.’ Then 400 years of even worse absentee landlords. 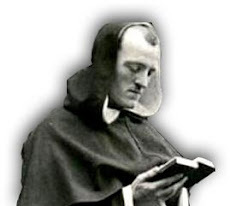 And now, says Fr Vincent: ‘If there is one truth more than another which life and thought have made us admit, against our prejudices and even against our will, it is that there is little hope for saving civilisation or religion except by the return of contemplatives to the land’. So we must return, and return in every possible combination, as families, as supernatural families (religious communities), and as solitaries. But it must be a religious return and a working return, a return to Nazareth.